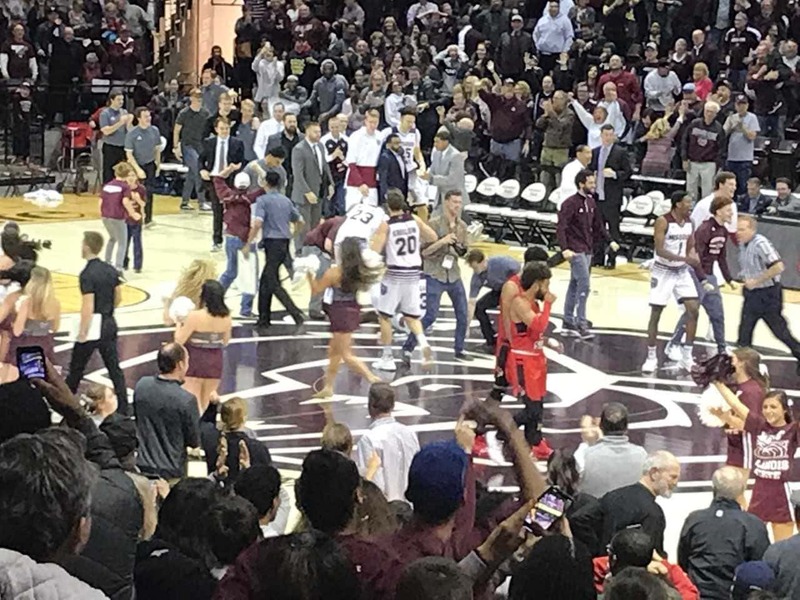 The Missouri State Bears get a miracle half-court banked-in shot by Jarred Dixon at the buzzer to stun the Illinois State Redbirds 66-65 at JQH Arena. The Bears trailed 65-60 with 13 seconds left in regulation, and got a driving layup from Josh Webster, who was fouled with 7.8 seconds. Webster made the free throw, pulling the Bears within two, 65-63. Keandre Cook stole the inbounds pass with five seconds left, but the ball was knocked out of his hands, and after a scramble for the ball that went into the backcourt, Dixon picked up the basketball, took one dribble, and flung the shot from the half-court line at the buzzer, banking it in as the Bears jumped on each other at mid court. Tulio Da Silva went 8-8 from the field, scoring 17 points to lead four Bears players in double figures. Ryan Kreklow added 14 points, with Dixon scoring 13 and Josh Webster nine points. Phil Fayne had 22 points for Illinois State, who drops to 14-11 overall, 7-7 in the Valley. The Bears trailed 32-27 at halftime, and the Redbirds built their lead to eight points, 42-34, with 14:06 left in the game. But MSU battled back, tying the game 42-42 with 11:00 to play on Cook’s two free throws. Kreklow drained a three pointer at the 10:22 mark that knotted the score again, 45-45. But when Milik Yarbrough put Illinois State ahead 47-45 midway through the second half, the Redbirds kept the lead until the final second. It seemed Illinois State had the game won when Zach Copeland hit a pair of free throws to increase his team’s lead to 65-60 with 13.6 seconds left in regulation. But as Webster drove the lane for the Bears and layed the ball in with 7.8 seconds, he was fouled and made the free throw, pulling MSU within two at 65-63. That set up the steal, the mad scramble for the ball, and Dixon’s game winner. The win puts Missouri State (13-12, 7-5) into a second place tie in the Missouri Valley Conference with Illinois State and Drake. The Bears will take on Evansville Wednesday night on the road, with tip-off scheduled for 6:00 p.m.
Ford knows what it’s like to hit a half-court shot. As a player at Illinois State, he hit a 40-footer at the buzzer on December 31st, 2005 to beat Creighton 53-50. “It may have been the only basket in my career,” Ford said with a grin. Missouri State improves to 10-2 at home this season. Sunday’s announced attendance at The Q was a season high 6,507. Da Silva’s 8-8 shooting performance tied a JQH Arena record for best field goal percentage (1.000). Alize Johnson held the previous mark by going 8-8 against Alabama A&M on November 11th, 2016. Video replay shows Dixon double-dribbled by taking a dribble, picking up the ball, and dribbling again before launching the half-court shot, but it was not called.